Exclusive FEMA Data Show How Federal Disaster Money Favors The White And Rich The data come from a successful 2017 Freedom of Information Act lawsuit against the Federal Emergency Management Agency. 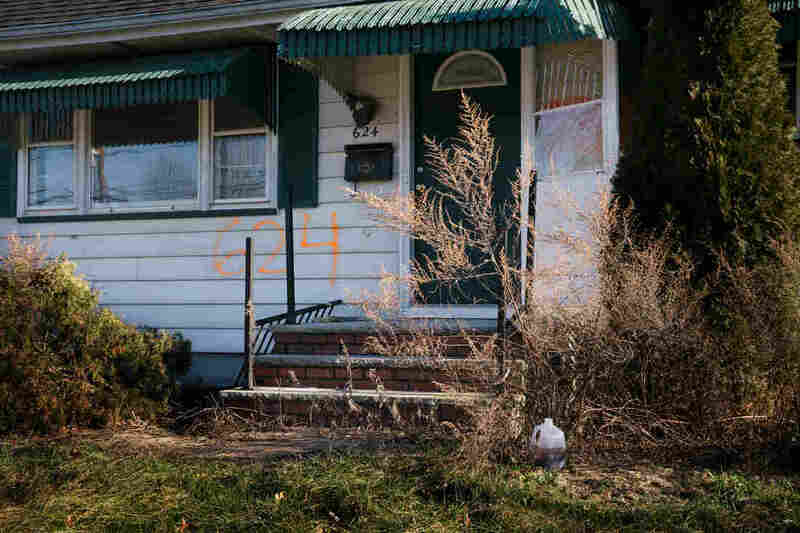 The numbers spray-painted on the front of this house in the Lost Valley neighborhood in Manville, N.J., indicate that it was bought as part of a federal disaster program. The program uses federal and local money to purchase houses that have flooded multiple times and permanently turn the lots into green space to reduce flood risk. Tuesday, March 5, 2019; Washington, D.C. – Through extensive reporting and an analysis of previously unreleased government data, NPR has found that across the country, white Americans and those with more wealth often receive more federal aid after a disaster than do minorities and those with less wealth. That's because federal aid is allocated based on cost-benefit calculations meant to minimize taxpayer risk, not on need. The data come from a successful 2017 Freedom of Information Act lawsuit against the Federal Emergency Management Agency. NPR reporters Robert Benincasa and Rebecca Hersher looked at a number of disaster aid programs and examined how they were implemented for different disasters in different places at different times. They found that the system tasked with helping communities after a disaster instead consistently chooses winners and losers. And, as climate-driven disasters become more frequent and severe, that trend is likely to accelerate. This series, from NPR's Investigations Team and Science Desk, will air on Morning Edition, Up First, and All Things Considered on March 5 and 6, respectively. A searchable and downloadable version of the FEMA database of property buyouts the network obtained is available on npr.org. Analysis of 40,000 property buyouts shows nationally, sales of flood damaged homes happened most often in places where the population was more than 85 percent white. Climate-driven disasters are becoming more frequent and severe, causing increased need for federal disaster spending. Today, nearly 70 percent of U.S. counties experience a natural disaster each year, compared to fewer than 20 percent in the early and mid-20th century.